I think the complexity of the process could be an indication that this is just hype, and that what will eventually rise will come after the re-zoning. A two year wait is nothing for NY real estate, and it would be silly of L&L to build a tower that's only 2/3 as large as what could rise if they wait a little bit longer. Well supposedly each team of architects produced two sets of designs. And if the rezoning does pass with a 2017 implementation date, I have no doubt L&M will take advantage of the higher FAR. If they actually do begin in 2015 (which I doubt), by the time the tower is topped off, the upped rezoning will probably be in place. I bet they will build foundations to accommodate a taller tower and in 2017 file another permit to build the extra floors. They'll have quite a jump-start on their competition too. According to our source, the designers each presented two different proposals, one in which the 25 percent provision was considered and another where the building could be torn down and replaced at the current floor-area-ratio with no restrictions, at an FAR of 18. There was no discussion of the recently announced Midtown East rezoning, which could allow buildings of exceptional quality to rise to a 24 FAR—50 percent bigger than the current zoning, a bonus that seems to tantalizing to pass up—because the plan had not yet been revealed. Those swooshing, slanting, undulating towers are already a dime a dozen and every other city from Chengdu to Astana is building them. Central business districts are more or less looking the same everywhere. But the mid-century towers along Park Avenue are the basis of that high-tech aesthetic and this area should be cherished since it has the best collection of them anywhere. It seems the designers behind this project, 432 Park, and 610 Lexington understand this...the general public will get it in a few decades when the current glassy meaningless curves and slants are dulled out by whatever trendy style catches on afterward. If preserved, I bet we will eventually cherish the buildings of Midtown East as we do the cast-iron buildings of SoHo, the warehouses of TriBeCA, or the wedding cakes of the Garment District. And it's nice that the straitlaced towers of Midtown East have a different feel than the ziggurats of the Financial District, and the future flashy towers of Hudson Yards. These distinctions only make the city a richer place. While swooshing towers might be a dime a dozen in places like London, which care about design, we don't have a single such tower. Also the designers behind 432 Park and 610 Lex didn't "understand" anything other than the cost mandate imposed upon them by the owners. Levinson conceded this paucity in several articles. Other than de Portzamparc's new PAS tower, KPF's Hudson Yards towers, 56 Leonard, and Torre Verre are the only striking, landmarks planned. We'll see if the latter towers are even built or built as initially envisioned. P.S. : Gehry's tower also is a striking landmark. Also the designers behind 432 Park and 610 Lex didn't "understand" anything other than the cost mandate imposed upon them by the owners. If those costs so limited their design freedoms then they should've walked away. These are top designers and they could have easily done so. Yes, perhaps if the developers had an unlimited budget to shell out on design, the architects would have done something more dazzling-- but they don't, and these architects were most likely chosen for their ability to design something sleek and elegant that would reference the style of the district. I see nothing wrong with that. Unlike a Kaufman/SOM pile, these buildings appear high quality, have fine details and proportions, and are quintessential New York. Foster is not going to walk away from anything in order to maintain commitment to great design. If by quintessential New York, you mean boring box, then I agree with you. It's a toss-up as to whether this tower or 432 Park is more boring. Well, it's unfortunate you don't like it and I'm prepared to deal with your whining until 2017. Amigo, don't act like some sort of whiny chick because I find this and 432 Park to be lame. I expected more here and across the street. If, in the 21st century, conservative boxes are the best that we can get in the city's top area, then I am disappointed. This tower is pretty boring. I am very surprised to hear it isn't a simple reworking of the current building. 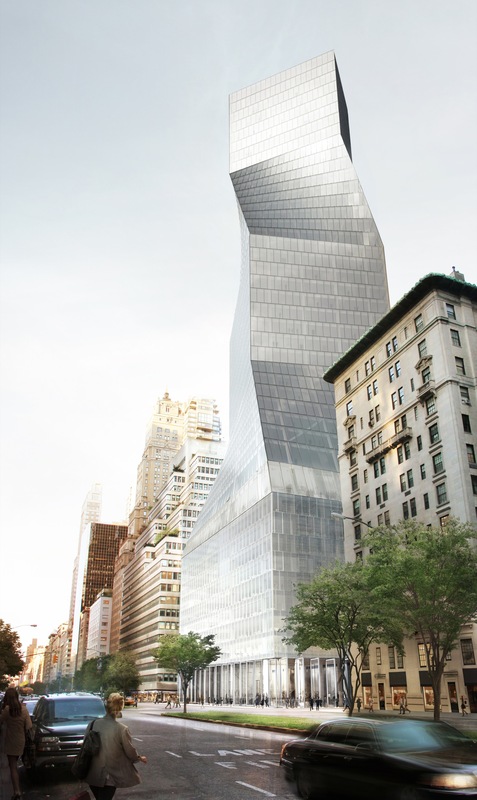 Norman Foster's proposed redesign of 425 Park Avenue was the victor in a four-starchitect face-off to determine the future of the blah brick and glass building between 55th and 56th streets. Developer L&L Holdings will begin work on Foster's design in 2015, and it should be done in 2017. While we wait for it to begin construction, Foster's design and the three runners-up, by Rem Koolhaas, Zaha Hadid, and Richard Rogers, are on display at the Municipal Art Society's Summit for New York City. We got our hands on the renderings, so let's hold our own face-off, shall we? Above, some new looks at Foster's design, "a tapered steel-frame tower rising to meet three illuminated sheer walls." The 41-story, 687-foot building has low, medium, and high-rise tiers "defined by a landscaped terrace with panoramic views across Manhattan and Central Park," according to the exhibition materials by Foster + Partners. "The core is placed to the rear, where glazed stairwells reveal long views towards the East River, while at street level, there is potential for a large civic plaza with significant works of art." "For Commercial Buildings," OMA's explanation begins, "Manhattan's zoning laws prescribe a silhouette from which there is no escape (yet): a stretched pyramid. Our current aesthetics oscillate between nearly exhausted orthogonality and a still immature curvaceousness. Our building is an intersection of these two observations: it proposes a stack of three cubes —the lower one a full solid block on Park Avenue, the smallest on top, rotated 45 degrees vis-a-vis the Manhattan grid, oriented beyond its mere location in a sweep from Midtown to Central Park.The three cubes are connected by curved planes to create a subtle alternation of flat and 3 dimensional places, each reflecting sky and city in their own way." 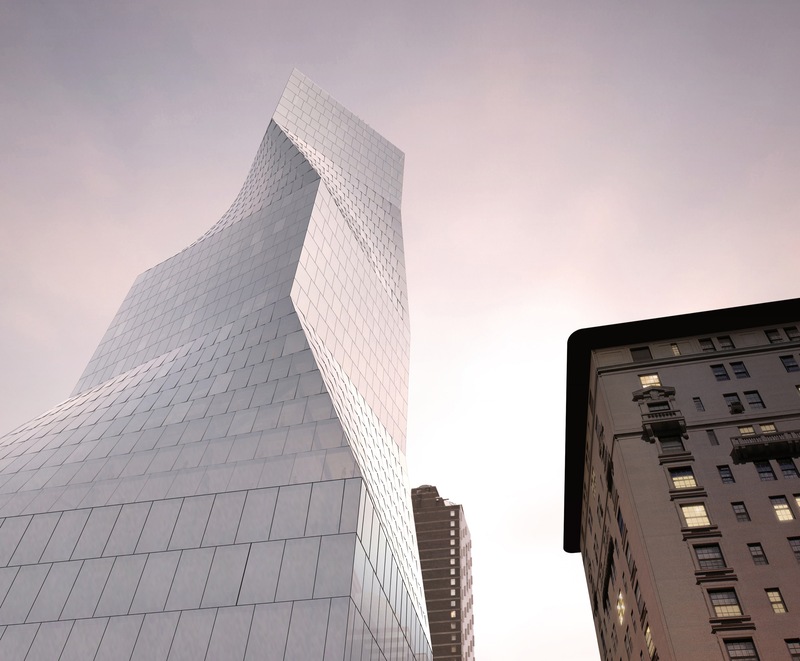 The archibabble describes the building, at 648 feet and 38 stories, as "a diagram of maximum beauty and maximum rentability," but apparently L&L disagreed. Rogers Stirk Harbour Partners, meanwhile, submitted the above proposal for a 665-foot, 44-story building meant as "a contemporary homage to the quintessential New York skyscraper." A rather boring description for a building that turns out to have some fun features: sky gardens—"we are reconnecting workers and the city with nature, by using different American landscape ecologies, from forest to alpine, to suit the different altitudes of each garden"—and exterior glass elevators. Zaha Hadid's design (above) was the only one besides Foster's to touch on the building's actual function as an office. Hadid's write-up for her 669-foot, 40-story project mentions its "openness, flexible design and technological efficiency." As for the design itself, Hadid calls it "a structure of timeless elegance, yet with a strong identity that reflects the complex and sophisticated age in which it was created and mirrors the exceptional setting in which it is placed. Our approach has been to unite the four fundamental qualities for the project — Function, Design, Culture and Value — and fuse them into a single seamless design which incorporates these characteristics in a harmonious and unified architectural concept." 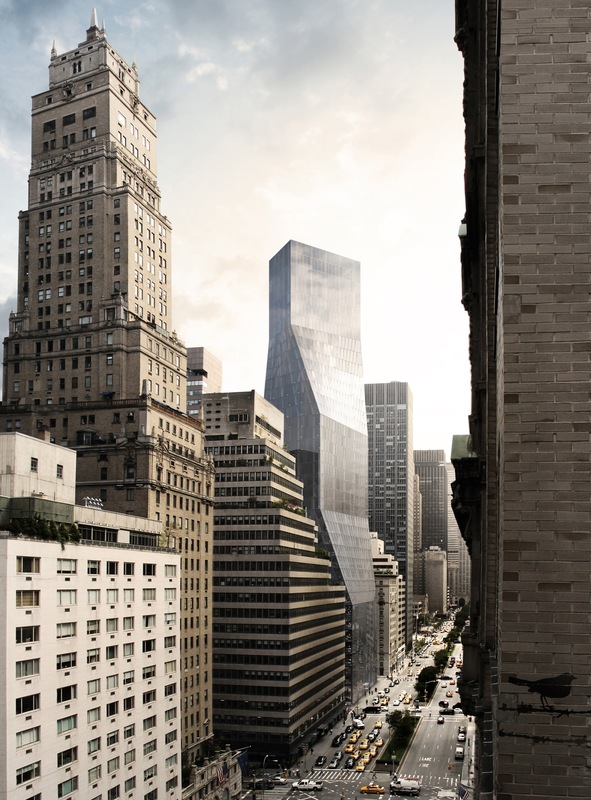 Park Avenue in Manhattan is ready to grow taller, and a starchitect-filled competition won by Lord Norman Foster revealed the first of what’s likely to be many new towers along the corridor. But what of the three runners up? Renderings from all four finalist—Zaha Hadid, Richard Rogers, OMA, and Norman Foster—have now been released by L&L Holdings and Lehman Brothers detailing four distinct visions for the future of the New York skyscraper. Foster’s final winning design will be presented at the Municipal Arts Society’s Summit for New York City, which begins on Thursday, October 18 (Foster will present on Friday at 9 a.m.). Also during the two day summit, an exhibition displaying the work of all four finalists’ designs will be on view. “The design challenge for 425 Park Avenue lies in producing a structure of timeless elegance, yet with a strong identity that reflects the complex and sophisticated age in which it was created and mirrors the exceptional setting in which it is placed. Our approach has been to unite the four fundamental qualities for the project — Function, Design, Culture and Value — and fuse them into a single seamless design which incorporates these characteristics in a harmonious and unified architectural concept. “Our current aesthetics oscillate between nearly exhausted orthogonality and a still immature curvaceousness. “Our building is an intersection of these two observations: it proposes a stack of three cubes —the lower one a full solid block on Park Avenue, the smallest on top, rotated 45 degrees vis-a-vis the Manhattan grid, oriented beyond its mere location in a sweep from Midtown to Central Park. 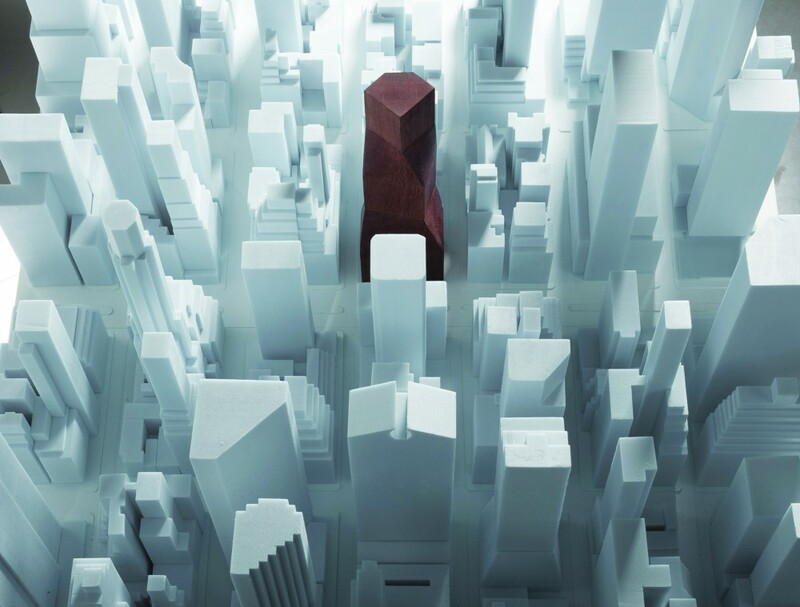 “We have created a contemporary homage to the quintessential New York skyscraper, by designing a tower that will define the next chapter in their illustrious story. Our solution acknowledges the design attributes of its neighbours on Park Avenue, but brings new qualities: honest expression; generosity; efficiency and humanity. The clear expression of the process of construction is evident from the huge 43 storey steel frame down to the smallest detail, this gives the building a human scale. “Our aim is to create an exceptional building, both of its time and timeless, as well as being respectful of its context and celebrated Modernist neighbours—a tower that is for the City and for the people that will work in it, setting a new standard for office design and providing an enduring landmark that befits its world-famous location. Last edited by Merry; October 19th, 2012 at 08:15 AM.